Long Term Capital Gain (LTCG) Tax on Stocks and Mutual Funds – Big changes introduced on Budget 2018 (Applicable from Financial Year 2018 – 19). Arun Jaitley’s Budget declaration to tax Stocks and Mutual funds came as a ‘bolt from the blue’ to stock market investors in India. Long Term Capital Gains (LTCG) from Stocks and stock oriented mutual funds will be taxed at a rate of 10 % subject to certain conditions. Tax burden of investors is likely to increase further with the retaining of ‘Securities Transaction Tax‘ (STT) and the newly introduced ‘Dividend Distribution Tax‘ (DDT). Let us have a detailed look at the proposed regime and analyse how it will affect you. Let us also see what are the escape windows available. Capital Gain is the profits, an individual makes, from ‘Sale” or ‘transfer’ of a Capital Asset. Securities which adhere to rules under the SEBI Act of 1992 classify as capital assets in India. Capital gains may attract capital gains tax subject to certain conditions. Short Term Capital Gains (STCG) refers to gains arising out of sale/transfer of assets within three years of ownership (in case of gold, property, etc) and 1 year of ownership in case of shares or mutual Funds. 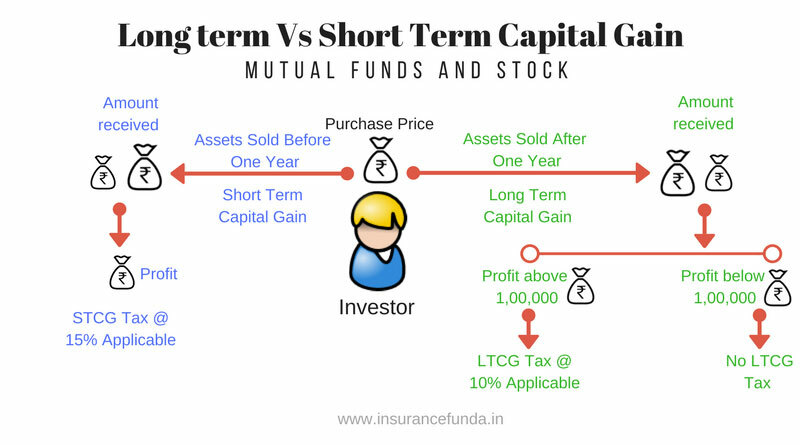 Long Term Capital Gain (LTCG) refers to gains arising out of sale/transfer of assets after owning them for three years (in case of gold, property, etc) and more than 1 year in case of shares or mutual funds. So in case of Shares and Mutual Funds, all profits arising from the sale or transfer within a period of one year is considered as Short Term Capital Gains, where as profits arising from a period more than one year comes under the purview of Long Term Capital Gains. As per the budget 2018 Long Term Capital Gains (LTCG) Tax will be applicable for Capital Gains on Stocks and Mutual funds at a rate of 10% per annum, if the capital gains in a financial year crosses Rs. 1,00,000. (Below 1,00,000 gains will not be taxed). In short, if the gains are in a period ‘less than one year’ you will be charged at a rate of 15%, where as if the gain period is ‘more than one year’, you will be charged at 10% per annum. Long Term Capital Gain Tax was present for equities and mutual funds before 2004 and was abolished to introduce Security Transaction Tax (STT) instead. At present, Securities Transaction Tax (STT) of 0.001% is applicable for mutual funds at the time of selling. On the other hand, 0.1% STT is applicable for direct equity shares both at the time of purchase and selling. STT which was introduced in place of Long Term Capital Gain Tax, after abolishing it, will continue along with the newly re-introduced LTCG Tax. Even though this proposed regime will bring in revenue to the government, it is going to eat into the profits of the investors. In order to seal the loop hole of investors switching to dividend option in mutual funds to escape the Long Term Capital Gain (LTCG) Tax, Government has introduced a Dividend Distribution Tax at the rate of 10% for mutual funds. Unlike the LTCG Tax which is paid by the investor, Dividend Distribution Tax is paid by the Fund house from the distributable surplus, before the dividend is paid. The interesting fact is that as the Long Term Capital Gain Tax is applicable only for individuals whose cumulative capital gains is in excess of Rs 1 Lakh, where as the Divident Distribution Tax (DDT) will have to be borne by all investors of equity oriented mutual funds. short-term capital gain = final sale price – (the cost of acquisition + improvement cost + transfer cost). Newly introduced Long Term Capital Gain Tax has provided a massive impetus to the ULIP plans. To make it simple, you need not pay any Capital Gain Tax for your ULIP policies unlike the mutual funds or stocks. Further to add, Dividend Distribution Tax (DDT) and Security Transaction Tax (STT) also become applicable only for Mutual funds. ULIP vs Mutual Funds – Which is better investment?